Dark magic meets the Old West in this rip-roaring middle-grade adventure series filled with scrappy heroes and diabolical villains. Brad McLelland was born and raised in Arkansas and spent several years working as a crime journalist in the South. In 2011 he obtained his MFA in creative writing from Oklahoma State University, where he met his writing partner, Louis. 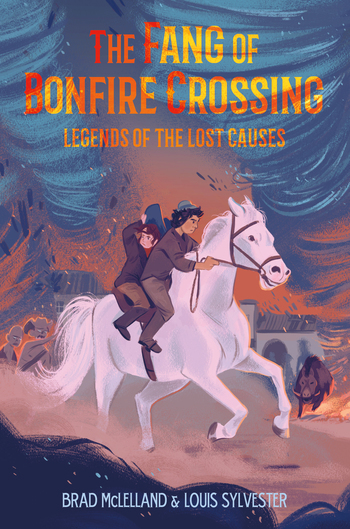 Together they are the authors of Legends of the Lost Causes and The Fang of Bonfire Crossing. A part-time drummer and singer, Brad lives in Oklahoma with his wife, stepdaughter, a mini Aussie who gives hugs, and a chubby cat who begs for ham. Louis Sylvester is a professor at Lewis-Clark State College in Lewiston, Idaho. He and his wife spend their free time playing tabletop games from his collection of over 1,000 card and board games. Louis enjoys watching Western films and reading fantasy novels. He has two dogs that go wild when they hear the word treats.